In 2010, information about a multi-institutional study that was led by researchers from the Lawrence Berkeley National Laboratory was released. The research looked into health dangers associated with third-hand smoke. Third-hand smoke refers to the residues left behind on most surfaces and objects after second-hand smoke has cleared. The study found that nicotine can remain on the surface of carpets, furniture, floors, walls and other materials for up to months after it was deposited. The study also found that nicotine residues could react with ambient nitrous acid and form carcinogenic tobacco-specific nitrosamines (TSNAs). 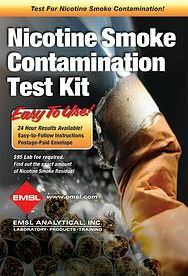 To obtain a Nicotine Smoke Contamination Test Kit or to learn more, please visit: www.EMSLTestKits.com. To learn more about nicotine testing services or other indoor air quality (IAQ) and environmental, health and safety services, please visit www.EMSL.com, email info@EMSL.com or call (800) 220-3675. EMSL Analytical is a nationally recognized and locally focused provider of environmental, indoor air quality, consumer product and materials testing services and products for professionals and the general public. The company has an extensive list of accreditations from leading organizations as well as state and federal regulating bodies.